oooohhhhh. this was one spectacular car. really incredible flame job and chromeography. 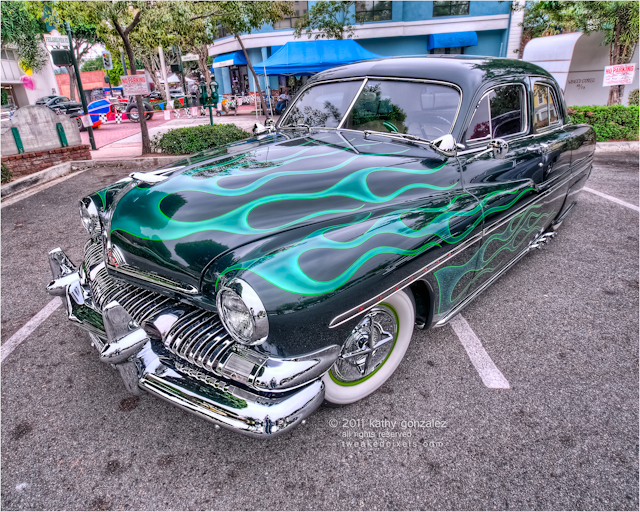 yet another in the land of unwelcome customs and low riders lot at the whittier uptown show. my only question in all the attention to detail, is why they used such a jolly green giant green on the wheels, rather than something from the same range as the hood flames? kinda throws me off a bit. question for you: what do you consider a professional photographer? i often get asked if i'm a professional, and am always at a loss as to how to answer. i look at them, they look at me. they blink, look quizzically. "do you work for a magazine?" blink. blink. i wonder why they bother to ask, most never look like the type that would buy a print, much less pay “professional” rates. i assume they want something for free, to use for their charity, whatever. if i state a price, i sometimes hear that mr. xyz only charges $X. well, then, go buy his/her pictures, it don't bother me none. i don't have the time or interest to peddle my wares or harass the owners. i think the basic definition, is that if you can sell a print, you're a professional. then, ya, i guess i am, in some fashion. on the other hand, i do this more as a hobby, to do my own thing after a long day at work, without other people telling me what to do. i'm a professional graphic designer, since that's what i've got a diploma in and how i make my bread and butter, one who farts around with cameras after work, then tweaks the images on a computer—still in designer mode. so anyway, ya i'm a professional. back in college i collaborated on a gallery show with a painter. i showed my black and white photography, he put up his paintings. i had cemetery images, close up detail stuff, abstract negative space, etc. the one comment left in my guest book that stuck out in my mind, was that "...the work looked like it was done by a graphic designer." i was never sure if that was meant in a good way or a bad way. i developed the stuff the same as a "photographer," so what is the difference? was it the way i cropped the images? the presentation? was it a snobby photography student? i don't remember. i didn't know anyone well at the school, and it wasn't advertised as photography done by a design major, so how would they even know? anyway, back to my point; everyone with a camera these days can call themselves a professional photographer. but the old rule still applies: garbage in, garbage out. i think people can judge for themselves. i usually just answer to the blinkers, "no," and they go away to stuff more of their flyers into people's cars.